White and wood are predominant in her room. As Fleur Xavier ushers us into her home in a high-rise building in Wadala in central Mumbai, she sounds almost apologetic when she mentions that her cosy 1,200-sq-ft pad (which she shares with her mother Loretta) is not what she calls “a showcase home". “I’ve designed it with me in mind, not as something people could come over to admire," she smiles. The living room is warm, with plenty of wood accents and earthy tones. 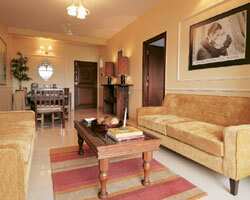 Two cushy honey-coloured sofas dominate the living space, separated by a carved wooden table from Sharma Farms in New Delhi (It cost around Rs8,000). The focus of the dining area is a wooden table for six, flanked by a sideboard and sleeper wood shelves. The living room opens out into a balcony, which doubles up as a small seating area, shaded by gauzy curtains. Xavier has collected souvenirs and knick-knacks from her travels to decorate her home—a wooden African mask, a Rajasthani painting, pottery from Hong Kong and a wooden turtle from Mauritius. “I bring back something for the house every time I travel, so that ensures my home is always evolving," she says. She has also left some spaces and surfaces bare so she can fill them up with souvenirs from her travels in the years to come. “I like classic, traditional styles," says Xavier, who has always been interested in designing for interior spaces. Around two years ago, she decided to take up designing in addition to modelling, and trained with Delhi-based architect and interior designer Arunjit Sodhi. She now has her own Mumbai-based firm, Space Style. One of the reasons that she picked design as an alternative career is “because I have good taste," she smiles. Her taste is certainly clean; her home has an old-world flavour, but with contemporary lines. And if you look close enough, there are surprising touches. Her dining table is a shade darker than the chairs, and a pair of chairs is different from the other four. “I don’t believe everything has to be a set. As long as you have a pair, it will not look strange." She designed most of the furniture and had her carpenter construct it. “When I bought this flat in 2000, I had done it up in a more contemporary style. But as I changed and evolved, I kept making small changes to the house till it got to where it is." Her white bedroom would be stark if not for the warmth that the wooden floor, earth-toned furnishings and warm lighting lend it. 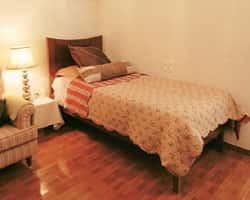 After her room’s wood laminate flooring warped because of the moisture in the climate, wooden tile flooring was installed. Xavier bought the interesting light fittings which are hanging from the ceiling in her room from Khan Market, Deilhi, for Rs6,000 each. “I loved that they were classic looking." A half wall separates a thin strip of space near the window, from the rest of the room. Xavier uses the smaller section as a work space, which holds her PC. “The wall also serves to give the room a bit of privacy from the other buildings around," she says. Gauzy white curtains have been used to keep out the strong sunlight. Earth tones make the living space cosy. Xavier has also come up with a novel way of doing up the facade of her wardrobe. Instead of faceless wooden doors, clear glass has been framed in the doors and backed by white linen curtains. Strips of wooden moulding decorate the front of the glass, while a wooden slatted door is put in to break the monotony. The bathroom is where Xavier has unleashed all her feminine design sensibilities. A frilly, pure white shower curtain she got in Dubai and sections of wall that she has hand-painted herself using white paint and a rose-motif stencil, are the focal points. And there’s one aspect of Xavier’s personality that stands out in every room of her home—her obsession with neatness. She straightens books and rubs specks of dust off every conceivable surface. “I’m Monica, I know," she laughs, as we head out the door.